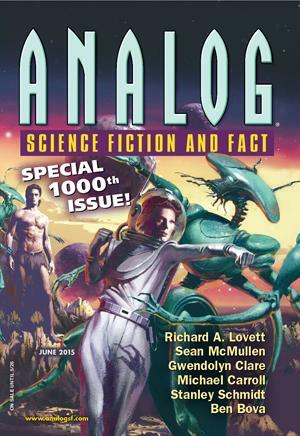 Worlds Without End retweeted a post from author Robert Sawyer the other day, congratulating Analog magazine on its 1000th issue. Seriously: 1000 issues of a classic SF monthly magazine, still going in a time where print is pauper and digital is king! I started reading Analog – which went through several name changes over the years – in around 1969, as tatty second-hand copies sourced from my favourite paperback swap shop in the Lusaka Central Arcade. It was easily the best of the magazines I had sampled – which included Amazing Stories, and The Magazine of Fantasy and Science Fiction – and I actually built up quite a collection, pretty much as consecutive issues, and was introduced to a multitude of amazing authors. I remember reading Larry Niven, Poul Anderson, Ben Bova, Asimov – and many others, some of whose stories are still vividly with me, even though I have completely forgotten who wrote them. Like the large red-haired men in kilts and feathers, who counted coup…I still haven’t found who wrote those ones. I even corresponded with the editor, in 1978 or so: I wrote to Ben Bova, commenting negatively on the politics of John Campbell and his editorial disdain for Africa, and was unexpectedly answered by Stanley Schmidt, who had just taken over – who had actually been to Africa, and who was far more sympathetic. So congratulations, Analog – and I hope you have many more issues! I must start reading you again…. This entry was posted in Books, Personal stories. Bookmark the permalink.